So you've been invited to a wedding. How fun! Now all you have to do is find a gift, put on your most flattering outfit, and go. Whoa. Not so fast. Before you head out the door to witness your best pal or coworker getting hitched, check out some of these common wedding etiquette mistakes that you don't want to make. Everyone knows how much work goes into planning a wedding and reception, right? Apparently not. There are quite a few wedding faux pas that most people have experienced, and all of them are fairly common. Wedding ceremony and reception planning go beyond the guest list. It involves ordering enough food and drinks for everyone and making sure all the guests have a place to sit. If there are favors involved, they need to be ordered or made in advance, so it's important to know how many people will be there. Always RSVP to let the bride and groom know whether or not you can make it. If your plans change, contact them immediately so they can adjust. If your invitation clearly states that you may bring a guest, then by all means, bring one. However, if your name is the only one on the invitation, don't ask that cute girl you just met or the guy you've been dying to go out with. Find another opportunity to get to know these people and go to the wedding alone. And who knows? Maybe you'll meet someone even better while line dancing at the reception. While some brides and grooms wouldn't even think of leaving children out of the wedding, others want the event to an all-adult affair. Honor their wishes and line up a sitter so you and your spouse or significant other can enjoy the wedding sans children. Read and reread the time that the wedding is supposed to start. Show up a few minutes early to make sure you're seated before the bridal party starts their march down the aisle. That doesn't mean you should be there an hour early, though. Ten to fifteen minutes before the time listed is just fine. You also don't want to be late. If traffic prevents you from showing up on time, slip into the room as quietly as possible and find a seat in the very back. Don't bring large wedding gifts to the ceremony because there probably isn't a good place to put it. Think about it. If everyone brought the gifts into the church, seating would fill up fast with toasters, mixers, and place settings rather than people. It's always best to have your gift delivered to the bride or groom's home, at least a day before the wedding. You don't want to burden them with having to transport large packages at a time when they need to be on their way to their honeymoon. Make sure you know what to wear to the wedding and dress according to the request on the invitation. Never wear white or any shade of off-white because you don't want to compete with the bride. If the invitation doesn't specifically state what style of attire you should wear, go by the time of the wedding. The later in the day the more formal weddings typically are. If you're still not sure, call someone in the wedding party. Never use your phone during a wedding ceremony. Turn your phone off before you enter the wedding venue. The bride and groom don't want buzzing, ringing, and other unexpected sounds interfering with their vows. You should also refrain from texting. Chances are the wedding planner has hired a photographer, so there is no need to photograph the ceremony. However, if you are itching to have an advance snapshot, turn off the flash. You don't want to blind anyone in the wedding party or the guests. 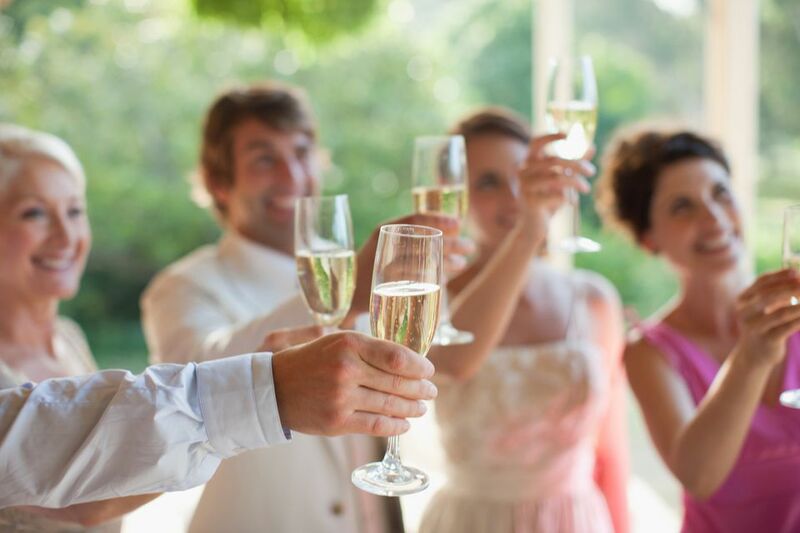 Most couples choose a select few people to present toasts during their reception. This is their moment to be in the spotlight, not yours. Even if you disagree with something that is said, and the urge to blurt your thoughts to the crowd is overwhelming, bite your tongue. If alcohol is served, and you have the desire to participate, do so very cautiously. Even if you're a happy drunk, you'll still take the focus off the event. Drunkenness is never appropriate. When you sense the party winding down, leave. The bride and groom are probably eager to move on to their honeymoon.